Michigan officials have recently confirmed the presence of bovine tuberculosis in a large beef herd in Alcona County. Bovine TB is a bacterial disease that also has infected free-ranging whitetail deer in parts of the northeastern Lower Peninsula of Michigan. Assistant State Veterinarian Nancy Barr says farmers in that area should do all they can to prevent deer from having contact with cattle feeding and watering areas. Cattle in Alcona, Alpena, Montmorency and Oscoda counties must be tested before they are moved off the farm, which can help prevent the illness from spreading. The Michigan Department of Agriculture and Rural Development will host meetings to discuss the latest findings Oct. 29 in Mio and Nov. 1 in Hillman. There are signs of bovine tuberculosis hunters may observe when field-dressing a deer. Lymph nodes in the animal’s head usually show infection first and, as the disease progresses, lesions may begin to develop on the surface of the lungs and chest cavity. In severely infected deer, lesions can sometimes be found throughout the animal’s entire body. 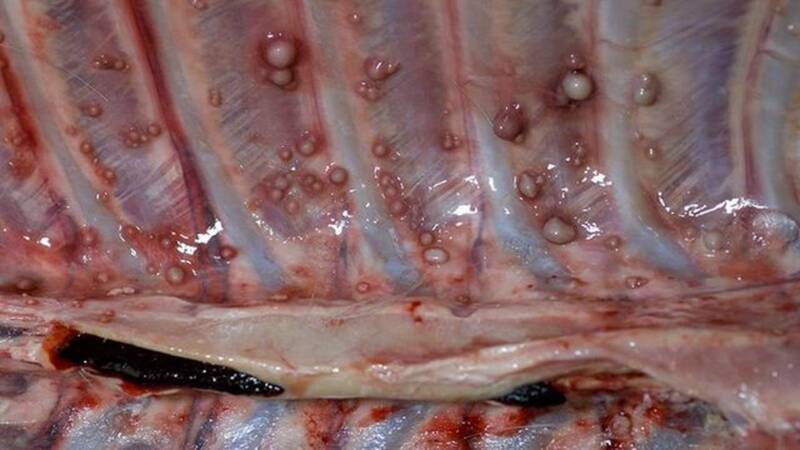 Deer with severe TB may have tan or yellow lumps lining the chest wall and in the lung tissue. Deer showing this type of infection should be submitted to the DNR for laboratory testing. In the years since bovine tuberculosis was discovered in wild white-tailed deer in Michigan, much has been learned about this contagious disease.